Sirocco by Paco de Lucía . Fifth volume of the official collection of Paco de Lucías’s transcriptions by David Leiva. 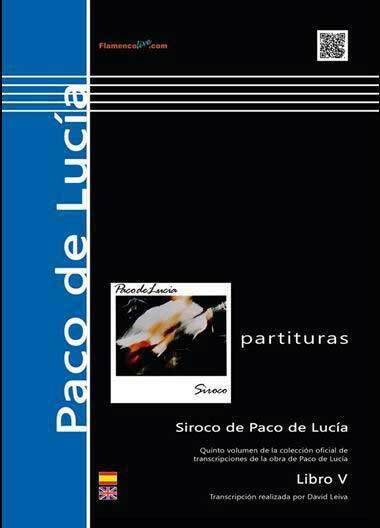 Flamenco-Live and David Leiva present the book of the master Paco de Lucía, SIROCO. The collection contains eight sublime flamenco pieces with a perfect interpretation. Without a doubt he was a turning point in flamenco guitar and music. He has made history by being the best playing the flamenco guitar master. This book is primarily intended for guitarists but any musician can read these scores. The eight songs are shown in standard notation and tablature with fingerings for hands, bumps and dynamics. His interpretation is as important as his composition, Paco de Lucía played, with a surprising mastery, highlighting some notes and stroking others with pure finesse. He has got the guitar concert to a new level not been seen before. Each piece is preceded by explanatory text, harmonic and rhythmic patterns. Arrived to Canada in about a week, book is great. Thanks a lot! Hi there! I ordered Sirocco and trhe delivery from Madrid to mid Finland was just 2,5 days. Cannot be any faster than that. Full points. The product is very good, just as I expected, so over all evaluation of the full service is 10 out of 10. Very good and have my gratitude for such a good service. Kindest regards!